"Very easy and moist cake that doesn't need any icing and whips up in no time!" In a large bowl, mix together the cake mix, pineapple and vanilla. Pour batter into prepared pan and bake for 35 minutes or until a toothpick inserted in the middle comes out clean. Allow to cool. This impressive pineapple angel food cake is impossibly easy. These were delicious and so quick and easy to make! I made them into cupcakes for a great WW 3 point snack. This recipe is so quick to throw together and tastes wonderful. I baked it 25 minutes and it came out just right. The warm pineapple aroma that lingers in the kitchen is very pleasant. We have a diabetic in our family and everyone else is watching their weight - this makes a wonderful recipe for all of us and my 4 year old grandson loves it too! 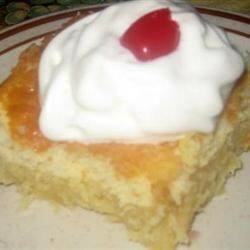 I made this gluten free using the kinnikinnick angel food cake mix. It was so easy and so good!